Atlantic Ocean (July 7, 2004) — An SH-60F Seahawk assigned to the “Dragon Slayers” of Helicopter Antisubmarine Squadron One One (HS-11) hovers over the flight deck of the nuclear powered aircraft carrier USS Enterprise (CVN 65) steams through the waters of the Atlantic Ocean after spending four days of liberty in Portsmouth, England. Enterprise is one of seven carriers involved in Summer Pulse 2004. 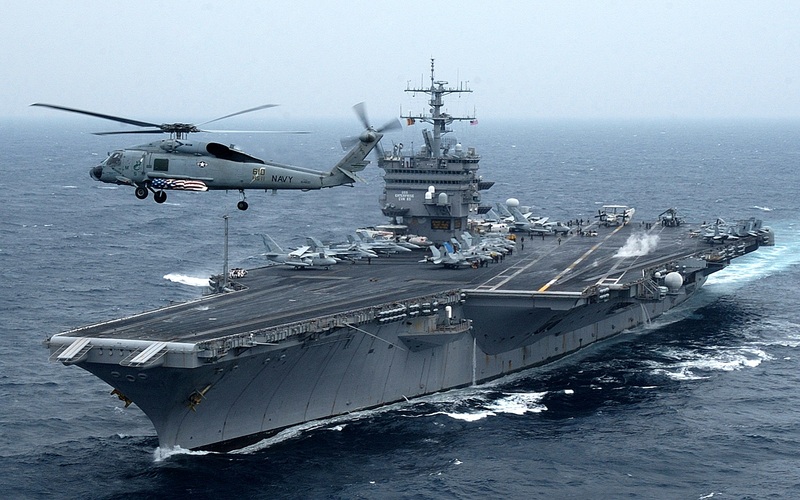 Summer Pulse 2004 is the simultaneous deployment of seven aircraft carrier strike groups (CSGs), demonstrating the ability of the Navy to provide credible combat power across the globe, in five theaters with other U.S., allied, and coalition military forces. Summer Pulse is the Navy’s first deployment under its new Fleet Readiness Plan (FRP). The strike group will conduct a scheduled training excercise followed by overseas pulse operations. Official U.S. Navy photo by Photographer’s Mate Airman Joshua E. Helgeson. Image released by LT. K.R. Stephens, PAO-CVN-65.